Jamaican Coconut Shrimp Stew – A quick, light and spicy shrimp dish simmered in coconut milk, inspired by my trip to Ochos Rios, Jamaica. 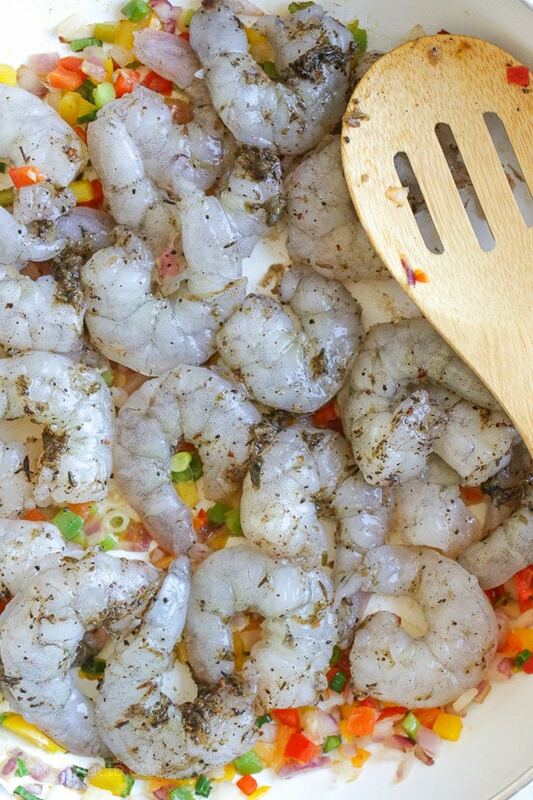 More shrimp recipes I love are Honey Garlic Shrimp, Indian Shrimp Garlic and Cajun Shrimp in foil. I’ve always been a fan of Jamaican food, so when I went there on vacation, I made it my business to eat as much of they local food as possible. There was a cooking demo one of the days while I was there and they made this really simple dish which I’ve recreated here. Beware, the Scotch Bonnet pepper is VERY hot. This tiny little pepper packs a lot of heat, I used only 1/4 of the pepper with the seeds and membranes removed and it was still spicy, but not too much that I couldn’t eat it. If you like spicy food feel free to add more. Warning, wear gloves while handling the pepper to avoid burning your fingers, or accidentally touching your mouth or eyes. 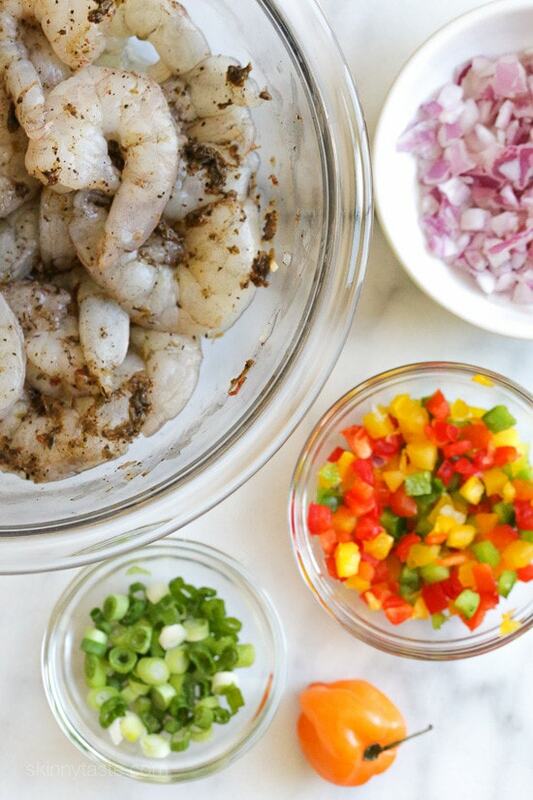 Season shrimp in a bowl with jerk seasoning. 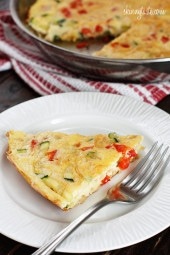 Heat a large skillet on medium low, add the butter or oil and chopped vegetables, cook until soft 3 to 4 minutes. 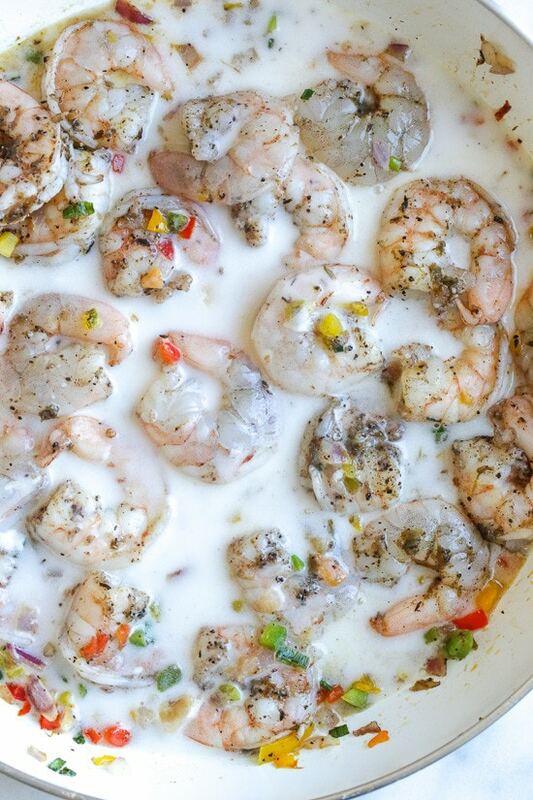 Add the shrimp, increase heat to medium and cook 3 minutes, add the coconut milk, cover and simmer until the shrimp are cooked through, about 3 minutes. Garnish with cilantro or scallions and serve. HOW DO YOU PRINT THESE?? We also enjoy sampling the Jamaican food when there. Can’t wait to try this. Do you by chance have a jerk ckicken recipe? I just made this today and it is delicious! I used Bada brand Jerk seasoning and a red habenaro pepper. I used 1/2 of the pepper because I like my dishes spicy and it was perfect! Just be careful to not let the coconut milk overcook or the fat will separate. It will still taste the same just not look as pretty. I prepped 4 servings with 1/2 cup rice for food prep for the week and I will definitely make again! Thank you! Turned out great, my kids even loved it! Next time I’m going to add extra bell peppers and double the sauce, per family request. Awesome when the whole family loves it! Made the shrimp this evening – soooo yummy. I don’t know what I did wrong, but I made this tonight and it was a mess. It smells great but my coconut milk looks like it curdled and separated and my shrimp aren’t cooked even after and covering and simmering for a total of about 12 minutes. I followed the recipe except for the hot pepper because my kids can’t eat spicy food. I simmered for 3 minutes and when I lifted the lid of my pan I had this nasty looking mess with curdled/separated coconut milk and raw shrimp. I cooked it 3 more minutes and the shrimp still weren’t looking cooked (I even tasted it, thinking the milk was throwing off the color of the shrimp, texture was not that of cooked shrimp). I did it a few more times, even bringing the mix to a boil and covering before reducing the heat. Still have unevenly cooked shrimp. Any ideas why I had this result? We were all so looking forward to this meal but my husband has now run out for burgers ???? So good! I made this tonight and since I couldn’t find the jerk seasoning I used Cajun seasoning. We loved it! Thanks Gina! You rock! I’m guessing one should use unsweetened coconut milk? This was delicious!! I followed the recipe except I used a whole jalapeño instead of the scotch bonnet. It was the perfect amount of heat and sweet. I will definitely be making this again! i made this a few weeks ago and LOVED it – but it was a bit too spicy for my husband, so i made my own JERK seasoning for the next time (i had cleaned out my spice cabinet, so it was easy to do). i made it again this week, but i NEVER labeled my JERK spice, and accidently used ras el hanout – and it was still VERY yummy – a happy accident! i also recommend eating this over quinoa – get that extra protein in! I've had this one bookmarked until I had all the ingredients at the same time! Had it for lunch today. To make it vegan (or for a meatless Monday) I used Jackfruit. I also used pickled jalapeño for the bonnet (just availability). Served over noodles! Yummy!! Thanks! Oh my! So yummy but if you substitute for habenoro pepper heed the warning of wearing gloves and don't try a little tiny bit for fun!!! 😉 took us an hour to recover from the burn! Very tummy dish! 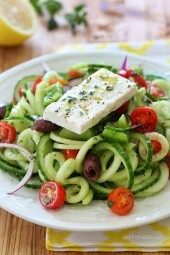 I bet this would go great over the cauliflower rice from TJ's!! I thought the same thing after making it the first time. I just roasted the cauliflower rice for 15 minutes at 425 degrees. It soaked up the stew liquid without getting mushy! 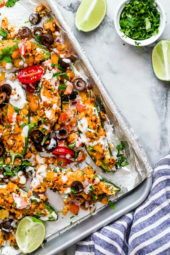 I loved it but I have a query can I try it with white sauce other than coconut? The coconut is a must to keep it authentic, but no rules to cooking, try it! So happy you enjoyed, you can leave out the scotch bonnet to keep it milder. Can this be successfully reheated? Yes, but shrimp is always best when cooked. 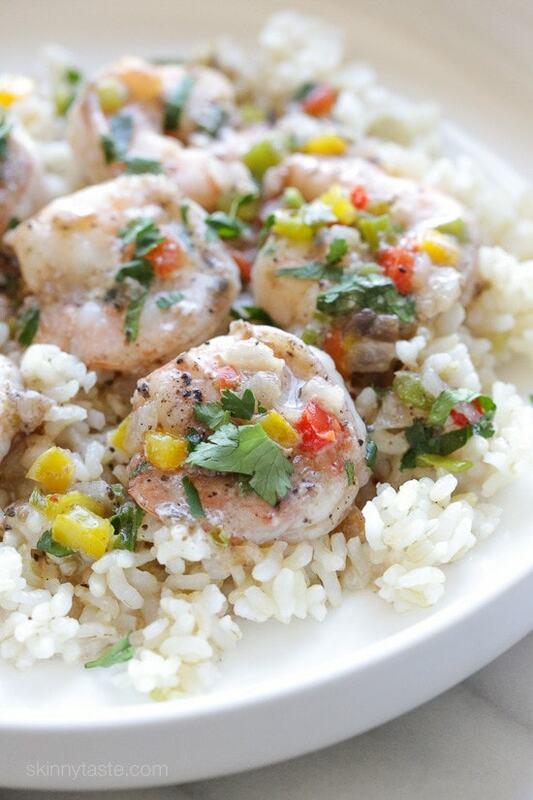 This looks so good… I have one person who is allergic to shrimp so I'm thinking of trying it with bay scallops. A perfect Friday dinner for Lent! It's pretty involved to make, they sell it on amazon. In Jamaica, the chef even used jarred but if you can't find it, I am sure you can google a spice blend to get close. Like the first commenter both my guys are allergic to shrimp, I think chicken breat cut into chunks would be a good substitute. Sounds delicious. This looks so delicious! I haven't heard of that pepper before–any substitute ideas? I used pickled jalapeño because I didn't want to pull out the gloves to chop a fresh (yes, lazy). Don't know how close to bonnet it is but it was tasty. I think this would be really good with some cut up boneless fish. I sometimes find light coconut milk in the aisle with the Asian foods. The same aisle that has the soy sauce. I am soooo bummed that my local Trader Joe's is out of coconut milk right now – something about their supplier. It's the only store in the area that carries light coconut milk. I can't wait to make this when the coconut milk comes in. Full fat is actually healthier! It's a good fat! Agree! Add the full fat! Super healthy! I am surprised that is the case, nearly any store on Long Island carries the light but I guess we are lucky. Anyway, If there is an ingredient you use often and have a hard time getting, Amazon is your friend. Here's a tip… light coconut milk is basically coconut milk with water! So use full fat, just use less and add half water. oh my gosh. looks soooooooooo good! Does the calorie count include the serving of rice included in the photograph? No, that would be extra. Do you have a coconut rice recipe to go along with this? Thanks! I do have one on my blog. any sub for scotch bonnet pepper if we cannot find easily? would jalapeño work? If you want the same heat as a scotch bonnet, a habanero would work best. Did you just serve this over regular rice? This looks so delicious! I've been having your recipes for lunches the past 2 weeks and I already lost 4lbs. It's great to lose some weight while eating great food! How would this be with chicken?? My fiancé is allergic to shellfish but the recipe sounds so good! I'm sure it would be good! How did it turn out with chicken?